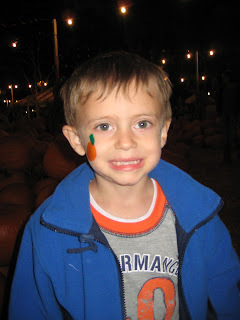 It was a bit overcast and a little on the rainy side (although we did not get wet), so Katie and I thought what better way to enjoy a Friday evening than to take the kids to the pumpkin patch. 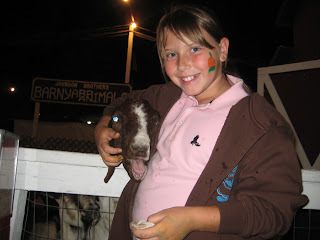 Again, with the BIG smile. 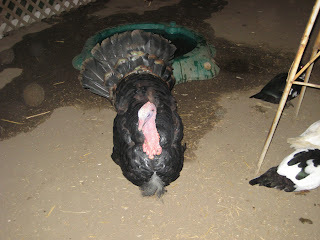 They have this cool pumpkin patch at a local college that has it all. 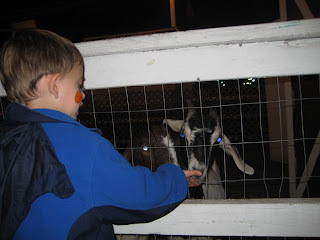 A bounce house, teepees, a haunted house (which I ALWAYS avoid - I am quite the wuss), some kind of bag thing that you can hit, barnyard animals, face painting, mechanical toys to ride and yes LOADS of pumpkins! All kinds, white, orange, cinderella, some kind of mixed looking ones that look like growths of some unnatural kinds. The kids love it, and Caiden has been BEGGING me to take him. I have to say, I probably wasn't in the most patient of moods. Caiden was a bit uncooperative with photos, my camera died yet again (even though I JUST put batteries in a few days prior), and it was a bit on the cold side. But it was wonderful to spend time with Katie and the kids and Caiden had a blast. After we took some pictures, the kids took off to play. 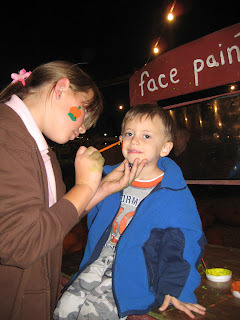 Christy even painted a pumpkin on Caiden's face for fun. 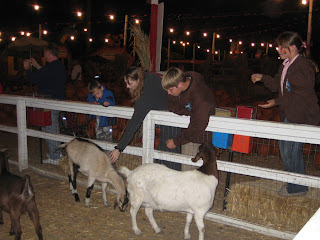 We also feed the animals, and rode some of the mechanical rides. 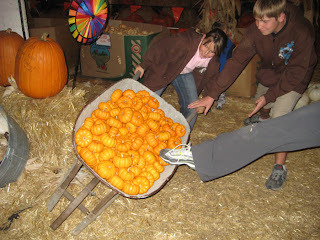 On our way out, Katie asked Christy to pretend like she was holding the wheelbarrow full of baby pumpkins. The problem: she actually picked it up and it tipped over. It was actually quite funny. Katie got a picture of it on it's way down. Notice my contribution (I stuck my foot out - like that was really going to help). 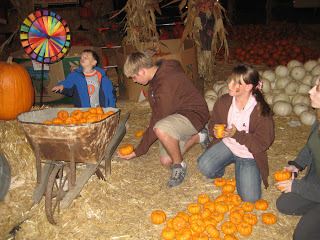 Anyway, we cleaned the pumpkin mess up, and laughed about what country bumpkins we seemed like on the way out. 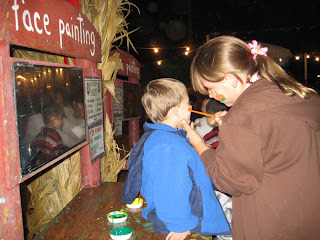 We tried to go to the pumkin patch a few days ago with Mom, Jim and some friends. We literally pulled into the parking area and the first raindrops started to fall. We went to the mall instead. The pumkin patch looks like it would have been more fun.